With a long history of reliable performance, the ASVF anti-siphon valve series is chosen more often by professionals than any other residential/light commercial anti-siphon valve on the market. The ASVF Series valves are a DVF valve with an atmospheric vacuum breaker (backflow preventer) built right in. Available in 3/4" and 1" FPT (female pipe thread) models with flow control for precise flow adjustments. Valve size selection is determined by the flow requirements of your system. For systems with flow 13 GPM or less use the 3/4" valve; for systems over 14 GPM use the 1" valves. Anti-siphon valves must be installed at least 6 inches above the highest point of water in your system. Anti-siphon valves must be installed in an upright orientation and no other valves can be installed downstream of the anti-siphon valve. Anti-siphon valves must not be subjected to operating pressure for more than 12 hours in any 24 hour period. Compatible with most 24V irrigation controllers. 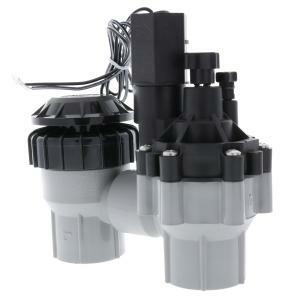 RainBird does not recommend using the ASVF Series valves in a two wire system set-up.